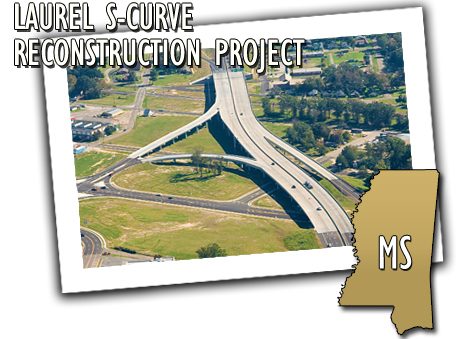 The Mississippi DOT's project team reconstructed and realigned an elevated segment of I-59 through Laurel, Mississippi, eliminating the notorious "Laurel S-Curve," which had one of the highest crash rates in the state. The reconstructed segment crosses six local streets and the Norfolk Southern Railroad, requiring a 1,980-foot-long, six-lane bridge structure featuring reverse horizontal curves that meet current Interstate standards. Challenges included constructing replacement housing for residents of a 72-unit public housing facility and addressing natural resource impacts. The team pioneered innovative financing methods that enabled the launch of the project at least three years earlier than otherwise would have been possible. The project dramatically improved safety, smoothed traffic flow, and ultimately was delivered under budget. Design changes, proactive coordination, and innovative financing produced a budget surplus of $6 million, which is being used to widen five additional I-59 bridges and two additional miles of roadway.